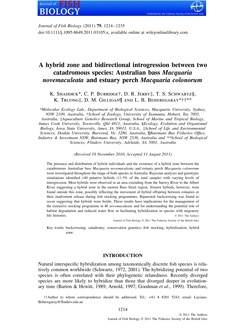 The presence and distribution of hybrid individuals and the existence of a hybrid zone between the catadromous Australian bass Macquaria novemaculeata and estuary perch Macquaria colonorum were investigated throughout the range of both species in Australia. Bayesian analyses and genotypic simulations identiﬁed 140 putative hybrids (11 � of the total sample) with varying levels of introgression. Most hybrids were observed in an area extending from the Snowy River to the Albert River suggesting a hybrid zone in the eastern Bass Strait region. Sixteen hybrids, however, were found outside this zone, possibly reﬂecting the movement of hybrid offspring between estuaries or their inadvertent release during ﬁsh stocking programmes. Biparental backcrossing was found to occur suggesting that hybrids were fertile. These results have implications for the management of the extensive stocking programme in M. novemaculeata and for understanding the potential role of habitat degradation and reduced water ﬂow in facilitating hybridization in species with migratory life histories.